We begin the second round of Bracket Six of the Fantastic Reviews Battle of the Books with False Covenant by Ari Marmell going against Earth Unaware by Orson Scott Card and Aaron Johnston. The winner will be the book I (Aaron) most want to continue reading after the first 50 pages. False Covenant: Pyr hardcover, July 2012, 280 pages, cover art by Jason Chan. False Covenant is the second book in the Widdershins YA series. It reached the second round by defeating Vampire Empire: The Kingmakers by Clay & Susan Griffith. False Covenant opened with an action scene in which our heroine Widdershins gets caught up in a robbery gone wrong. In the second 25 pages, we learn that Widdershins is returning to her criminal roots in hopes of saving her struggling tavern, the Flippant Witch. Adding to her problems, a mysterious creature is terrorizing the citizens of Davillon at night, and the Finders' Guild orders Widdershins to investigate. Meanwhile, a stranger named Evrard is looking for Widdershins. Before he finds her, the phantom-like creature finds him. Earth Unaware: Tor hardcover, July 2012, 364 pages, cover art by John Harris. 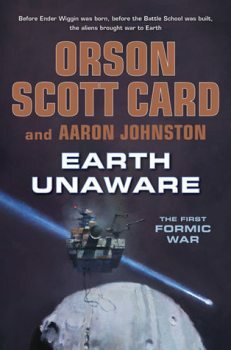 Earth Unaware is the opening volume in the First Formic War series, a prequel to Card's classic novel Ender's Game. It advanced to the second round by defeating The Snow by Ross S. Simon. The first 25 pages of Earth Unaware consisted of a chapter from the point of view of Victor Delgado, a young engineer mining comets with his clan beyond the orbit of Pluto, who learns of an object decelerating toward the solar system, which may be an alien spacecraft. Now in the second 25 pages, we have a chapter following ambitious business leader Lem Jukes, who plans to steal the comet currently being mined by Victor's clan, to test his company's new "gravity laser." The beginning of chapter three shows some New Zealand soldiers being tested for an elite fighting force, including a young man named Mazer Rackham. The Battle: Both False Covenant and Earth Unaware are entertaining and engaging through 50 pages. 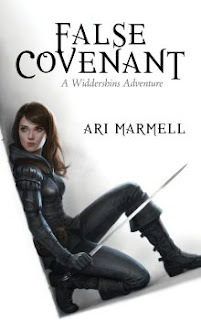 Starting with False Covenant, Widdershins is a spunky YA protagonist, and the story is moving along briskly so far, making the book easy to read. There are some good hints of who the players in the tale will be, including the enigmatic character Evrard. But it might have behooved Marmell to give us a better sense through 50 pages what's at stake in this story, to make the book harder to put down. "He told me you were going to be the captain of the ship," said Dublin. "He called you 'most capable.'" A compliment from Father? A sign of the apocalypse. Of course Father was probably just trying to put Dublin at ease about the crew. "Did he advise you to take any precautions on my account?" asked Lem. "Did he in any way suggest that you were to take care of me? Look out for me? Keep and eye on me?" Dublin looked confused. "Your father cares for your well-being, Mr. Jukes. You can't fault him for that." "A yes or no, Dr. Dublin. Did he give you special instructions regarding me?" Dublin was taken aback. He fumbled, searching for the right words, trying to remember. "He said I was to make sure nothing happened to you." So there it was. Undercut by Father again. The paranoia seeping out of this passage makes Lem an intriguingly unlikeable character, which makes me want to keep reading. Earth Unaware advances to the semifinals, to face either After the Fall, Before the Fall, During the Fall by Nancy Kress or Pazuzu's Girl by Rachel Coles.